Rub containers- clear design so you can easily identify your spice, whether it&apos;s a bbq rub, steak seasoning, seafood spice or otherwise. Spice Shaker- Shake or pour with ease! Glass Spice Containers- Stylish design fits seamlessly into the contemporary household. 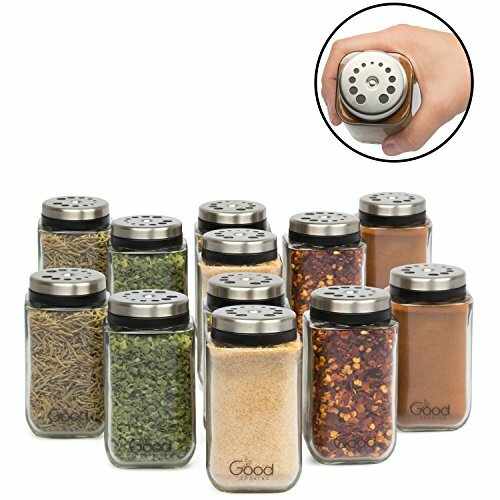 Adjustable Glass Spice Jars- Set of 12 Premium Seasoning Shaker Rub Containers with 6 Pouring Sizes- Just turn Metal Lid- These durable, stylish glass spice jars by Good Cooking blend seamlessly into the contemporary kitchen. Choose from 6 different pouring sizes for spices as small as cinnamon and as large as tarragon. - Durable glass design- long-lasting quality construction makes these spice jars ultra durable-- Individual jars hold 180 mL and measure at 4" x 2.3" x 2.3"
- Adjustable Glass Spice Jars- Turn the metal lid to choose from 6 different pouring sizes, for spices as fine as cinnamon and as thick as tarragon!